Photo credit: CDC, Janice Haney Car. Guest Blogger Dr. Rodney E. Rohde (bio below) writes: The U.S. Department of Health and Human Services (HHS) has identified the reduction of healthcare-associated infections (HAIs) as an Agency Priority Goal for the Department. HHS is committed to reducing the national rate of HAIs by demonstrating significant, quantitative, and measurable reductions in hospital-acquired central line-associated bloodstream infections and catheter-associated urinary tract infections (1). In this national context, recent data show that Americans visit the doctor approximately 12 million times each year to get checked for suspected staphylococci or MRSA skin infections. Estimates are that 1 of every 20 hospital inpatients will contract a HAI (2). This is roughly 270 deaths per day by one estimate – think of an airplane disaster with no survivors every day as a comparison. It appears that more people in the US now die from MRSA, especially healthcare acquired, than from HIV/AIDS. MRSA incidence and the low levels of literacy about antibiotic resistant infections in the general public are on a natural collision course. 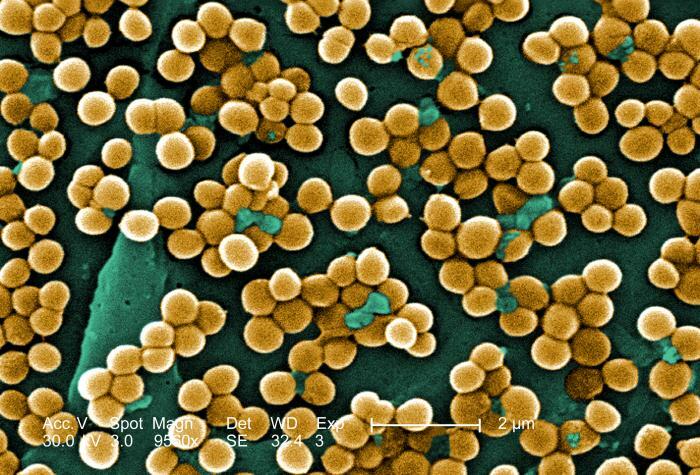 The health implications for society are startling and this brewing public health storm should be a wake-up call for all involved in the prevention and treatment of MRSA and other antibiotic resistant infections. Traditional medical approaches to infection control, antibiotic prescribing and usage, and how the healthcare practitioner relates to the public in general, and to individuals in particular, are no longer adequate in light of this growing healthcare emergency. It has been my experience that individuals who are diagnosed with MRSA infections (and other HAIs) need an informed healthcare professional to explain a number of complicated issues to them to help the individual understand the dangers of these nasty antibiotic resistant infections. This, in turn, will lead to greater acceptance and adoption of infection control and prevention. For example, I conducted a study for my dissertation that details the experiences of ten participants who have been diagnosed with MRSA (3). Briefly, this study provides a new model of how a person with MRSA in the general public learns and adapts to the infection. Their experiences emerged to create critical implications for practice and research. Almost all individuals had important advice for professionals about the nature of a consistent message for an MRSA plan. The embedded features of this plan were that people make the difference in these life-changing diagnoses. Likewise, all participants echoed the need for consistency of MRSA information and a step-by-step plan to manage the condition. Particular attention should be paid to the following areas: (a) the patient-healthcare provider interaction, specifically to create an open and non-threatening environment for learning to occur, (b) the delivery of critical information about the importance of having an MRSA diagnosis based on laboratory culture and antibiotic susceptibility testing, (c) specific education on what a MRSA infection looks like, including images/pictures and MRSA stories for patients, (d) the use of podcasts, digital video, and other electronic media (e.g. Facebook) to provide patient education beyond the initial MRSA diagnosis, (e) specific education about infection care, control, and prevention to themselves and others, and (f) guidance for individuals about sources of information and the credibility of sources. In regard to the use of podcasts and other electronic media, the message should be formed with a combination of stories from MRSA survivors and healthcare professionals to build a strong, synergistic media tool. The implications for practice and research based on the literature and results of this study indicate a need to address issues of how the general public discovers, learns, and adapts to antibiotic resistant infections, especially MRSA. Likewise, this study emphasizes the critical importance of informing healthcare professionals and health educators (e.g. universities, schools, and other related institutions) about the need for better programs of patient education and continuing education surrounding the pre and post diagnosis of MRSA infections. The participants in this study all emphasized the critical nature of talking to others that had already experienced MRSA with respect to getting an insider’s perspective on lessons learned. Finally, the participants in this study appeared to utilize self-directed learning and, to a lesser extent, transformational learning to challenge the healthcare system in regards to what content they needed about MRSA and how they might best learn to understand the disease. It may be possible to build on this desire to impact the healthcare system by inviting individuals who have experiences with MRSA to join a healthcare associated advisory committee. US Department of Health and Human Services, Health Care-Associated Infections. Department of Health and Human Services. HHS Action Plan to Prevent HealthCare-Associated Infections: Roadmap to Elimination.US Department of Health and Human Services, Washington, DC, USA (2012). Rohde, R.E. & Ross-Gordon, Jovita. MRSA model of learning and adaptation: a qualitative study among the general public. BMC Health Services Research, 2012, 12:88. Dr. Rodney E. Rohde is a Professor, Research Dean and Program Chair of the Clinical Laboratory Science program in the College of Health Professions, at Texas State University. Dr. Rohde’s background is in public health and clinical microbiology. He has a bachelor’s degree in microbiology, a master’s degree in biology/virology and a PhD in education from Texas State. His dissertation was aligned with his clinical background: MRSA knowledge, learning and adaptation. His research focuses on adult education and public health microbiology with respect to rabies virology, oral rabies wildlife vaccination, antibiotic resistant bacteria, and molecular diagnostics/biotechnology. He has published over 30 research articles and abstracts and presented at over 100 international, national and state conferences. He was awarded the 2012 Distinguished Author Award and the 2007 ASCLS Scientific Research Award for his work with MRSA. Recently, his work was the focus of an educational campaign regarding the important research focus of MRSA, which featured Dr. Rohde in a video by Texas State University that has been used by numerous media outlets. Learn more about his work here. Thanks Dr Rohde for this fascinating article. There’s a certain amount of “sniffiness” about qualitative research amongst scientists familiar with quantitative data (like me!). But, having recently dipped my toe into the qualitative research world (to assess patient and staff views of a new ward partition system), I can personally affirm that it can be just as scientific as quantitative research. Once thing that became immediately clear is that handing out a survey to patients and staff was not a good route. To understand what other human beings are really thinking, you need to sit them down, talk to them and come up with a way of meaningfully reporting what they say. A major drawback of this is that n tends to be small in these studies (10 participants in this case), which seems unsatisfactory to those familiar with quantitative data studies. However, it’s not worth interviewing more people when the same themes continue to emerge. Jon, I appreciate your comments regarding the nature of qualitative versus quantitative research. I come from a long history of public and clinical microbiology background steeped in quantitative research. However, as my work reflects, I now find that in many cases, hearing the “stories” in some aspects of the scientific and healthcare world can enlighten, and perhaps solidify, our understanding of quantitative research. I guess that I’ve seen the great value in truly listening to what’s behind some of those numbers. And, it’s paid great dividends at the intersection of what’s happening in the trenches versus the experiential things that patients and others relay to me/us. Let us never forget that listening is just as important as measuring. They can’t be exclusive of each other. Informative study as it shows a line of action about MRSA patient. Great article but I hope, at some point, you start selling the party line at the U.S.D.H.H.S. and mention that all forms of Healthcare Associated Infections(HAI) are preventable. As far as I know the U.S.D.H.H.S. is waiting for and sometimes paying for the development of “Best Practices” to be developed at the state level and is not responsible for much of anything and unfortunately the Great State of California is not developing “any” “Best Practices for the prevention of HAI”, “do the math”! As far as the Veteran’s system, do not even ask! Here is my latest and greatest to the powers than be in California, hopefully someone at the U.S.D.H.H.S. can actually do something productive concerning the prevention of HAI and make a phone call and make this happen, some of your, or make that my money is involved in my request so hopefully you will pass this on! Oh yea, almost forgot, please ask your brethren to support the currently up and running “Database of Best Practices for the Prevention of Healthcare Associated Infections” at the California Department of Public Health, you can use my password to take a look at it. “freedomOFinformationAct”, it is cps sensitive! Re: Opportunity to enhance efforts of the California Department of Public Health’s Healthcare Associated Infections(HAI) program. Please allow me to thank you for all that you and your office do for the wellbeing of all California citizens, I really appreciate it. At this time my humble advocacy for the prevention of Healthcare Associated Infections(HAI) in our Veterans Hospitals has identified an opportunity to enhance the excellent work currently underway at the California Department of Public Health’s(CDPH) HAI program. Due to the CDPH’s being a public agency and its relationships to private, philanthropic and public health organizations it is rapidly becoming premier resource portal for the prevention of HAI in the world. Having access to real-time monitoring would also place the CDPH in a potential position of leadership of large scale process improvement hopefully leading to standardized and efficient processes. All forms of HAI, according to the U.S. Department of Public Health and Human Services, are preventable and should be treated as any other preventable disease with the largest contributor, as with the rest of healthcare, being a well-educated patient. Technically, the CDPH’s HAI program is second to none, user friendly and inspirational to the non-healthcare consumer like myself, it is not. Please review the great done by the Washington State Hospital Association(WSHA) concerning HAI, should I advocated for the State of California to develop a completely redundant portal? My understanding is that U.S. Department of health and Human Services funds were in part responsible for the development of the site. Once again, than you and your staff for what you do and especially for your efforts concerning “Lets get Healthy California”. Honorable Governor Edmond G. Brown Jr. I agree with you on the need to do everything possible to prevent HAI, and that patient education should be part of this. Thanks for the reply! Frightening, many patients do not understand the lifestyle changes they must initiate and follow through with in order to not only treat, but contain such an insidious infection. those potentially exposed and those in close personal contact with infected individuals, differing emphasis on messages) educational campaign led by an association of hospitals and public health officials should commence, and the seriousness of the infection treatment regimes be emphasized. Follow up of treatments needs to improve to ensure we aren’t creating resistance to yet another antimicrobial tool in our inventory. Perhaps a university of public health teaching hospital to sponsor fellowship study on topic could be proposed, something to research. Good thesis topic for a doctoral candidate. The FDSA recently announced a plan to support phasing out the use of “medically important” antibiotics used as growth enhancement in feed animals. If they are considered important because they help treat human disease, builing up immunities to them is not a good idea, from any perspective, either human or animal.